The 2019 season starts on Aug. 1. The age of your oldest player on April 30th, 2019 will determine your 2019 team age (USSSA Baseball Age Calculator). All teams need to re-register for 2019 beginning August 1, 2018. You can register your team at www.usssa.com and for assistance check out (Team Information). Cost to do so is $55. 1. Please note that sites/locations may change without notice due to field availability. Also, tournaments may play Sunday games at alternate locations due to field restrictions. 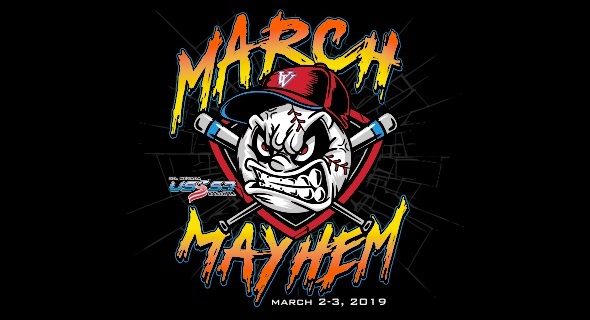 If a tournament is cancelled for any reason, USSSA and Vegas Valley Baseball have no financial responsibility other than to refund the entry fee for the cancelled tournament. Every effort will be made to complete the tournament, but in the event the tournament cannot be completed we will refund on the following criteria: A full rainout and no game started a full refund; 1 game played a 1/2 of entry fee refund will be issued; 2 games played no refund will be given. The tournament director has the right to alter schedules, adjust time limits, or adjust the number of playoff participants in order to complete the tournament. The tournament director also has the right to alter the amount of the refund. 2. When entering a tournament you need to know that no refunds will be given to a team that drops out of the tournament 10 days prior to the start of the tournament or after the brackets are published, whichever comes first. 3. Registering for a tournament does not guarantee that you will play your games at Big League Dreams Park (BLD) . Field restrictions and size of various age groups make it impossible to schedule all games at BLD. 4. All teams participating in USSSA leagues and tournaments must have a team insurance policy. 5. Any team winning a tournament from Veteran's Day 2018 to May 1, 2019, will receive a World Series berth. Team rosters and players are not frozen until May 1. The only exception to this is players and teams with Elite World Series berths. Note that players frozen to a major team can be released, but they must go to another major team. They cannot drop down in class to a AAA or AA team. 6. Teams that win a "AAA" Division 3-Day Tournament owe a play-up tournament at the major level. A team that wins a AA Division 3-Day Tournament must play a tournament at the AAA level. The play up should be in the next available tournament that the higher division is offered. 7. All teams must report to their fields or registration desk one hour before there scheduled games times. When circumstances arise where we can start early through out the day or tournament, teams must be prepared to start at least one half hour before there scheduled game time, this is to keep the tournament moving along at all times. 8. For all tournaments, any team may register, regardless of the # of registrations. Registration will get you listed in our "Who's Playing" section at the bottom under "Teams Who Have Registered." Once a team submits payment, we will then move them up to the top under the "Teams Who Have Secured A Slot" section. Only those teams who submit payment are guaranteed a spot on the schedule. We will look at our field space to determine the amount of teams we can take per division. Once that number has been reached, we will close down the division and start a waiting list. 9. There will be a $200 drop out penalty for any team dropping out within 14 days of the tournament. 10. NO METAL CLEATS ARE TO BE WORN ON BLD, ARROYO GRANDE 5-8, OR DESERT BREEZE MOUNDS, AND NO METAL CLEATS WILL BE ALLOWED IN DIVISIONS 12U AND BELOW. 11. For three-day tournaments, we need at least 6 teams in each classification (AA, AAA, MJ) to keep them separate from one another, and for two-day tournaments we need at least 5. When those numbers aren't reached, we combine the classifications into an "open" division. Usually, the AA's are able to be kept separate and the AAA's and Majors are combined. Please note: Our tournaments sometimes begin play as early as 7:45 AM on all days of the tournament and may go as late as 9:00 PM starts. Teams must be prepared to play at any time during the day. No entries will be taken contingent on playing only at a certain time and no changes will be made to posted schedules because you are playing later or earlier than you would like.